Predicting the Indian General Election through poll aggregation. One for the weird files.... A group of men in Bibpur, Haryana, are spearheading a campaign to bribe politicians to ensure wives for villagers in return for their vote in the upcoming general elections. Could Social Media make a difference? Exactly how good are our pollsters? A great and funny piece on the US media ignoring the Indian election, as well as the present state of India's own media. 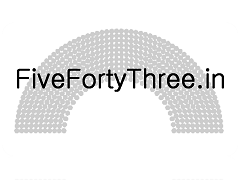 FiveFortyThree.in projects NDA to win 231, UPA to win 140 and OTHERS to win 172 seats.